Sunny McDonald and her vampire boyfriend Magnus are on the run—accused of treason and wanted alive…or undead. And her own twin sister is the slayer sent to track them down. Rayne would do anything to save her sister Sunny from the Vampire Consortium dictator who wants her dead. Instead, she’s been commissioned by Slayer Inc. to bring her twin back for justice…which Rayne knows means certain death. She also knows that if she and her boyfriend Jareth go against orders, they’re not only signing their own death warrants, but those of every vampire in the Blood Coven. As a rival slayer with a personal vendetta moves in, Rayne and Jareth know they must do something to stop her. So they embark on their most dangerous journey yet, deep, down beneath the streets of New York City and through the Gates of the Underworld itself. But when a greedy god demands the ultimate sacrifice, will Rayne be forced to choose–between her sister…and the vampire she loves? One of the more persistent problems I have with the Blood Coven Series as an adult is the effort it takes for me to remember that this series is all in fun, as well as the notion that it shouldn’t be so much work to do so. Rayne McDonald, in particular, is exasperatingly self-absorbed. She’s impatient, narcissistic, irresponsible, and over-indulged by everyone around her. I’ve never read a character that causes so much chaos and destruction, yet gets praised for her valor and courage by those who’ve suffered the most. It makes me want to bang my head on my desk. 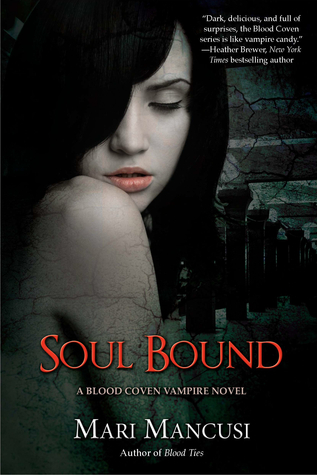 Here’s the fun part though: Soul Bound is not written for adults. Once I put on my mental Doc Martens and stomped my way through the novel, it was a lot of fun. The entire story is filled with a busload of oddities, from a 700-plus-year-old vampire pouting his emo-hazed eternity away (but I kind of like emo—shh—don’t tell! ), to a horrific, yet fairly avoidable, slaughter (oops! ), and even an Underworld ruled over by a Vampires vs. Zombies-addicted Hades. And Rayne’s the one driving. The entire story is impossible and fun; even more so than the previous stories in this series I’ve read. The twins are in trouble—again—and it’s up to Rayne to get them out of it. Unfortunately, she seems capable of only the opposite. There are also some horrific moments in the story, and Rayne’s rapidly evaporating guilt over the trouble she causes is difficult to accept. Luckily, Mancusi makes sure there’s a healthy dose of fun waiting just around the corner. Soul Bound is either incredibly frustrating, or highly entertaining, depending on your frame of mind. I imagine Mancusi must have had a great time writing this novel. I enjoyed this addition to the series more than the others I’ve read, possibly because I gave up any attempt at a grownup analysis of the story, got comfy, and followed wherever the characters led. If you’re in the mood for something breezy and fun to indulge your inner teen vamp fan, this story may be the perfect thing.